With the proliferation of third-party APIs and microservice architectures, modern web servers can make as many outgoing HTTP requests as the number of incoming HTTP requests they serve. A typical web application can interact with third-party APIs to handle payment processing, send email, track analytics, dispatch text messages, verify mailing addresses, or even deliver physical mail. A server can also rely on internal APIs to fetch account information, start asynchronous processes, or perform complex searches. Programs that initiate a high volume of outgoing HTTP requests must minimize the overhead of each in order to remain performant and optimize resource utilization. One of the best ways to minimize HTTP overhead is to reuse connections with HTTP Keep-Alive. This feature is commonly enabled by default for many HTTP clients. These clients will maintain a pool of connections—each connection initializes once and handles multiple requests until the connection is closed. Reusing a connection avoids the overhead of making a DNS lookup, establishing a connection, and performing an SSL handshake. However, not all HTTP clients, including the default client of Node.js, enable HTTP Keep-Alive. One of Lob’s backend services is heavily dependent on internal and external APIs to verify addresses, dispatch webhooks, start AWS Lambda executions, and more. This Node.js server has a handful of endpoints that make several outgoing HTTP requests per incoming request. Enabling connection reuse for these outgoing requests led to a 50% increase in maximum inbound request throughput, significantly reduced CPU usage, and lowered response latencies. It also eliminated sporadic DNS lookup errors. Running a benchmark validates the performance benefits of HTTP Keep-alive. The following chart displays the total time taken to make 1000 GET requests for both non-reused and reused connections with a varying number of requests made concurrently. It shows that for all levels of tested concurrency, reusing connections reduces the total run time by a factor of roughly 3. Another observed benefit of reusing HTTP connections is reduced CPU utilization. On Mac OS X, this reduction manifests in the Node process itself and in a process named mDNSResponder, an operating system service responsible for resolving DNS. 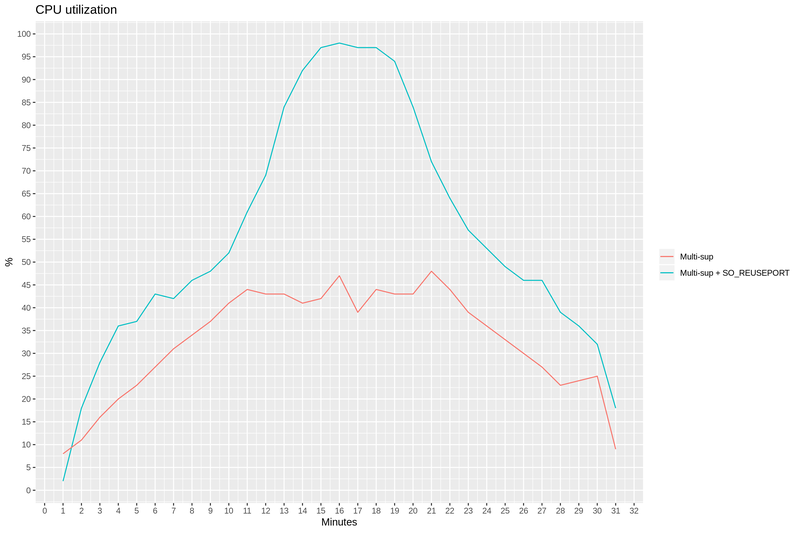 Running top -stats pid,command,cpu | grep -E "(mDNSResponder|node)\s" during both benchmarks shows the contrast in CPU usage. Inspecting the flamegraph of the benchmark script without connection reuse reveals the reason for increased CPU utilization in Node. A large percentage of CPU time is spent on establishing connections and performing SSL handshakes. For example, the flame fragment below shows that 14% of measured CPU ticks occurred while creating a socket. It should be noted that initiating connections also incurs overhead for HTTP servers. Therefore, reusing connections also reduces overhead for servers handling these requests. 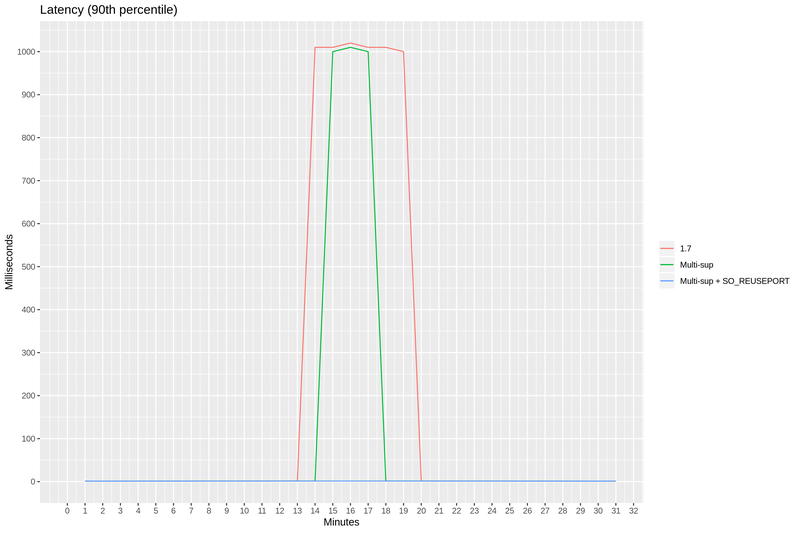 Flamegraphs of each benchmark are available to explore: flamegraph without connection reuse, flamegraph with connection reuse. The benchmarking scripts are documented in node-keep-alive-benchmark. Reusing connections also eliminated a set of DNS errors that occurred sporadically within our service. When connections are not reused, a new connection is initialized for each outgoing request. In Node, this initialization includes a DNS lookup to determine the IP of the domain to send the request to. A high volume of DNS lookups can lead to sporadic errors of the form Error: getaddrinfo ENOTFOUND. Based on several issues in the Node repository (nodejs/node-v0.x-archive#7729, nodejs/node-v0.x-archive#5488, nodejs/node#5436) this error can occur when a DNS server fail to respond, perhaps due to it rate-limiting requests. Reducing DNS lookups can reduce or eliminate these errors. In some cases, reusing connections can lead to hard-to-debug issues. Problems can arise when a client assumes that a connection is alive and well, only to discover that, upon sending a request, the server has terminated the connection. In Node, this problem surfaces as an Error: socket hang up. To mitigate this, check the idle socket timeouts of both the client and the server. This value represents how long a connection will be kept alive when no data is sent or received. Make sure that the idle socket timeout of the client is shorter than that of the server. This should ensure that the client closes a connection before the server, preventing the client from sending a request down an unknowingly dead connection. For Node services, the agentkeepalive library provides HTTP and HTTPS agents that enable connection reuse by default. These agents also have other sensible defaults that the standard libraries agents do not. Connection reuse should provide significant performance improvements to services written in any language that are making numerous outgoing HTTP requests. Some HTTP clients enable this behavior by default, but not all. Some widely used languages and libraries do not enable HTTP Keep-Alive by default, such as Node, so be sure to check the documentation and source code. By the way, Lob is hiring! If you are interested in joining a growing company that fosters curiosity, diligence, and collaboration, we’d love to hear from you. Check out our careers page for more information. Both HTTP 1.x and HTTP/2 rely on lower level connection-oriented protocols, namely TCP/IP and TLS. These protocols provide reliable delivery and correct order when data is chunked into multiple packets. TLS also includes encryption and authentication. The HTTP client needs to open a connection before it can send a request. For efficiency, each connection is likely to be reused for sending subsequent requests. To ensure this is the case while using HTTP 1.0, the client can set the connection: keep-alive header, while HTTP 1.1 and HTTP/2 keep connections alive by default. Web browsers maintain “warm” connections for a few minutes, and server-to-server connections are usually kept alive much longer. The WebSocket protocol (built on top of HTTP) only allows for explicit closure of underlying HTTP connections. What this means, performance-wise, is that measuring requests per second gets a lot more attention than connections per second. Usually, the latter can be one or two orders of magnitude lower than the former. Correspondingly, benchmarks use long-living connections to simulate multiple requests from the same device. However, there are scenarios where this assumption does not hold true. For example, low-power IoT devices cannot afford to maintain active connections. A sensor could “wake up”, then establish a connection to a server, send a payload request, receive an acknowledgment response, close the connection, and go back to “sleep”. With such a workload, the connection-per-second and request-per-second rates would be the same. In this article, we look at scaling Elixir to handle 100k connections per second. We tested against Ranch, which is the socket acceptor pool at the heart of the Cowboy web server. With Ranch, it is possible to implement a server for any TCP/IP- and TSL-based protocol, which makes our benchmark not specific to HTTP. We used Ubuntu 18.04 with the 4.15.0-1031-aws kernel, with sysctld overrides seen in our /etc/sysctl.d/10-dummy.conf. 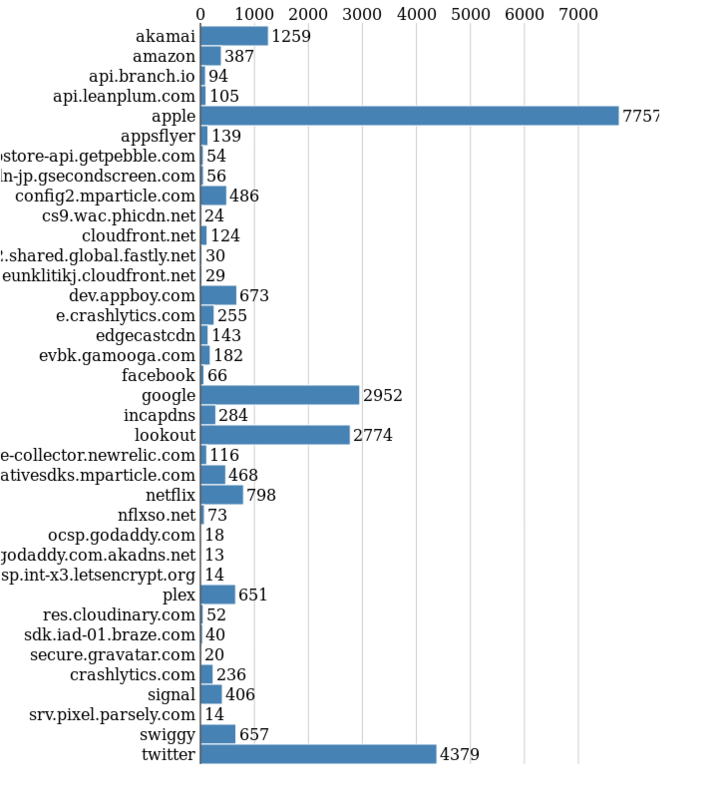 We used Erlang 21.2.6-1 on a 36-core c5.9xlarge instance. To run this test, we used Stressgrid with twenty c5.xlarge generators. In the first test, we used unmodified Ranch 1.7. The connection rate graph shows a clear breaking point at 70k connections per second. After this point, connection latency grows, causing the rate to peak at 82k connections per second. 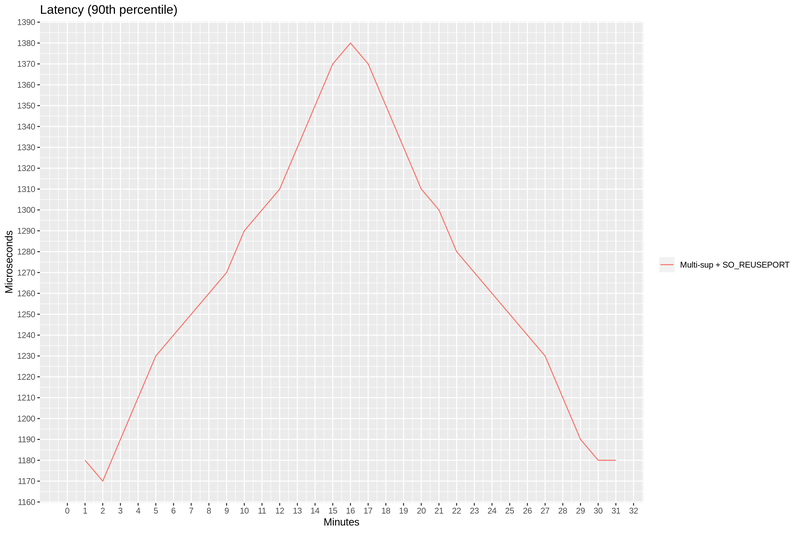 [IMG]Another good way of oberving the bottleneck effect is the 90th percentile latency. 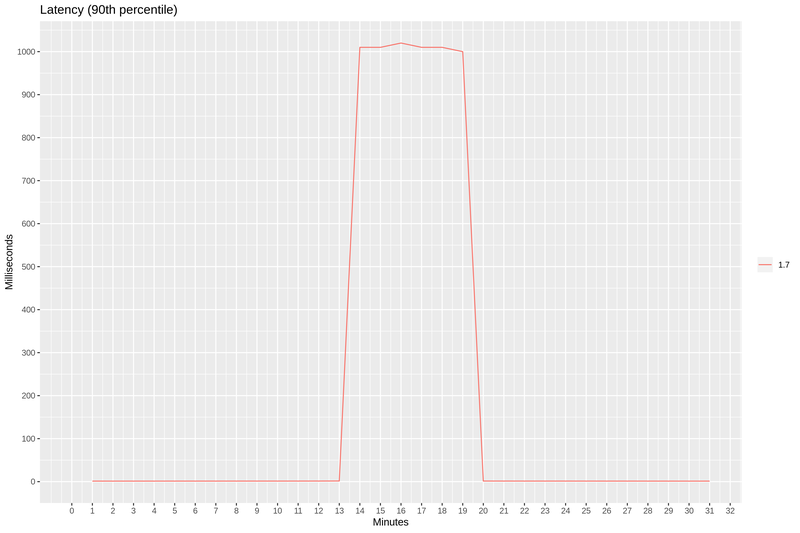 At 14th minute mark, the latency jumps from single-digit milliseconds to 1 second. [IMG]To understand this bottleneck, we need to take a quick dive into the architecture of Ranch. Ranch maintains a pool of acceptors to enable more throughput when handling new connections. By default, Ranch starts with 10 acceptors. In this test, we set it to 36—the number of CPU cores on our c5.9xlarge. 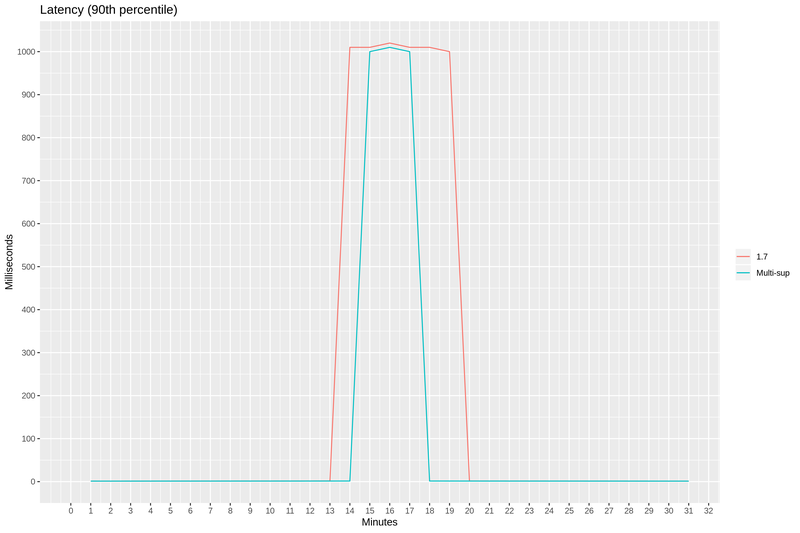 We also performed the same test with acceptors set to 4x and 16x number of CPU cores, with negligible differences. This behavior makes it possible for our server to accept new connections with a high degree of parallelism. When a socket is accepted, it is passed to to a newly-started connection process. However, all connection processes are started by a single connection supervisor. This supervisor becomes our primary suspect in our search for the bottleneck. 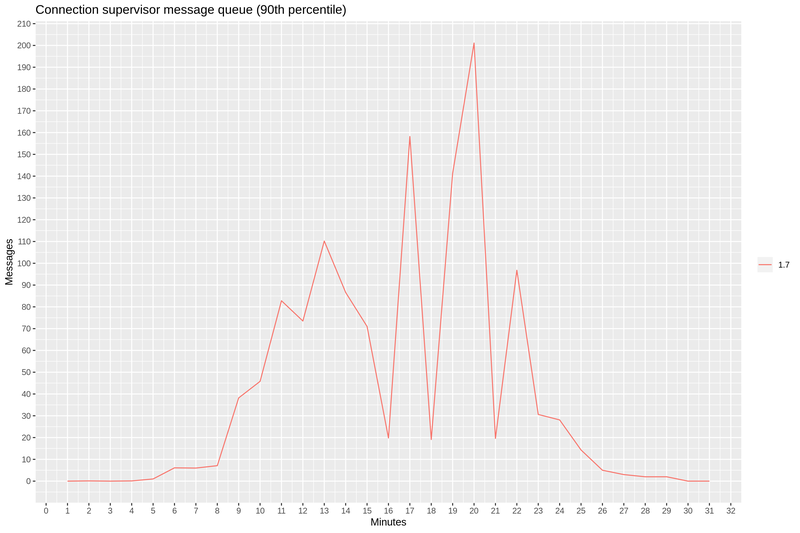 To test this theory, we modified our test server to report the supervisor’s message queue length. 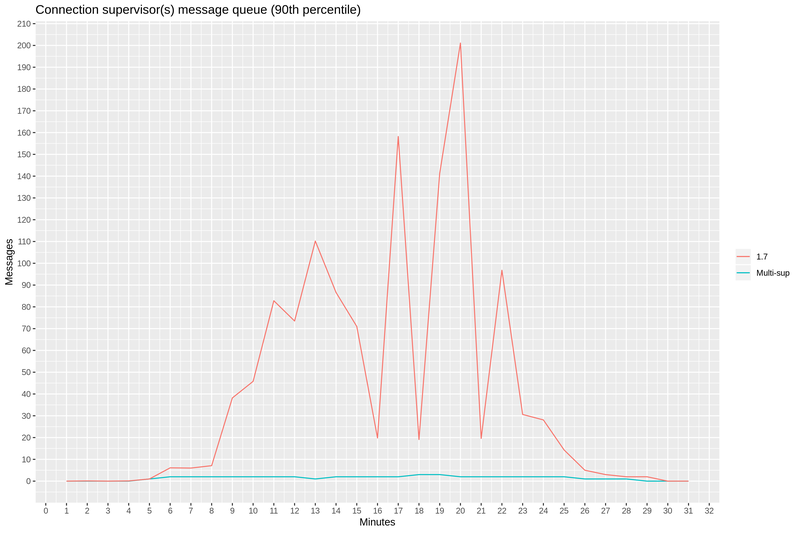 Indeed, we observed between 20 and 200 messages in the 90th percentile, starting at 9th minute mark. [IMG]The good news is that Ranch maintainers are well aware of this problem. There is a pull request with a proof of concept that introduces acceptor-supervisor pairs. With acceptor-supervisor pairs, there should no longer be any points of contention in the path of creating new connections within Ranch. To verify this, we collected a similar report for the total message queue length for all 36 connection supervisors. 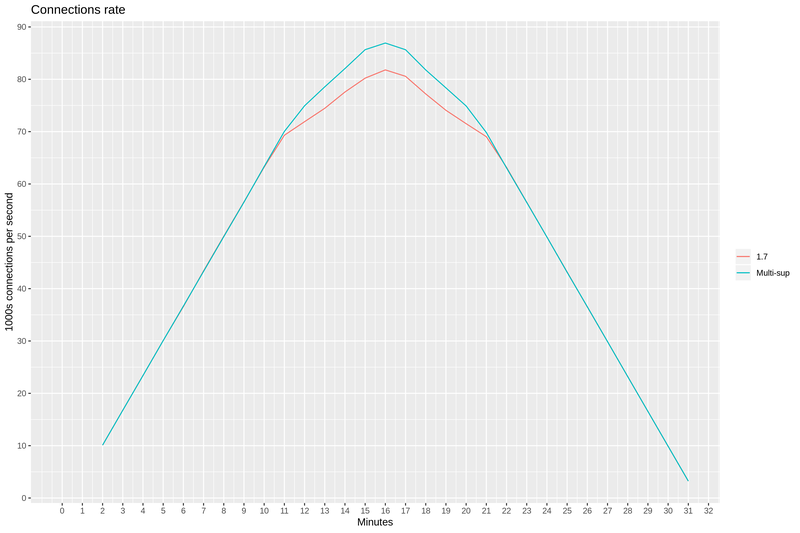 The 90th percentile now stays below 3. 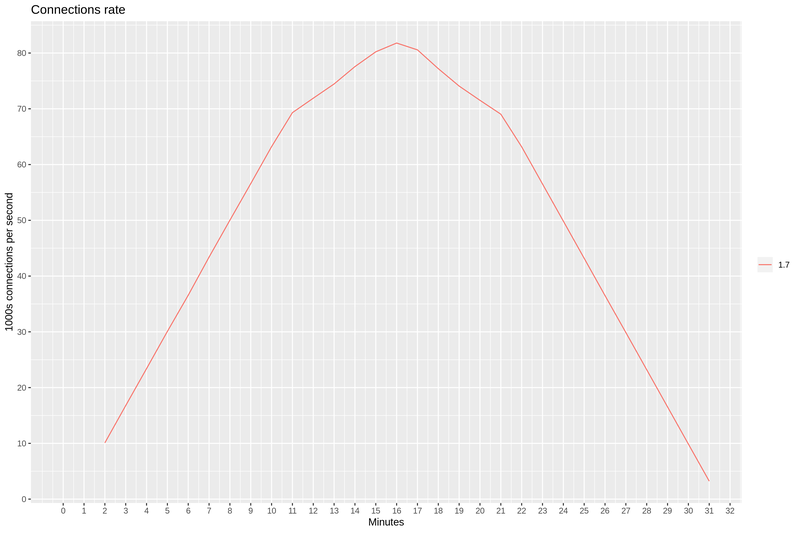 [IMG]But is it too early to celebrate—at 15th minute mark, 90th percentile latency jumps to 1 second again. [IMG]The breaking point in the connection rate graph is less pronounced, but remains at about 70k connections per second. [IMG]To understand this bottleneck, we need to understand how TCP/IP is implemented inside the Linux kernel. When the client wants to establish a new connection, it sends a SYN packet. When the server receives SYN, it places the new connection in SYN queue and reports it as being in a syn-recv state. The connection stays in syn-recv state until it is moved to the accept queue. When the userland program—in our case Ranch—invokes the accept() function, it removes the connection from the accept queue, and the connection becomes established. Cloudflare has a blog post with a detailed explanation of this mechanism. We created a bash script that records the number of connections in syn-recv state during our test. Around 11th minute, the number of connections quickly reaches 1k. With the maximum SYN queue length set to 1024 with the net.core.somaxconn sysctl parameter, overflowing SYN packets get dropped. The clients back off and re-send SYN packets later. 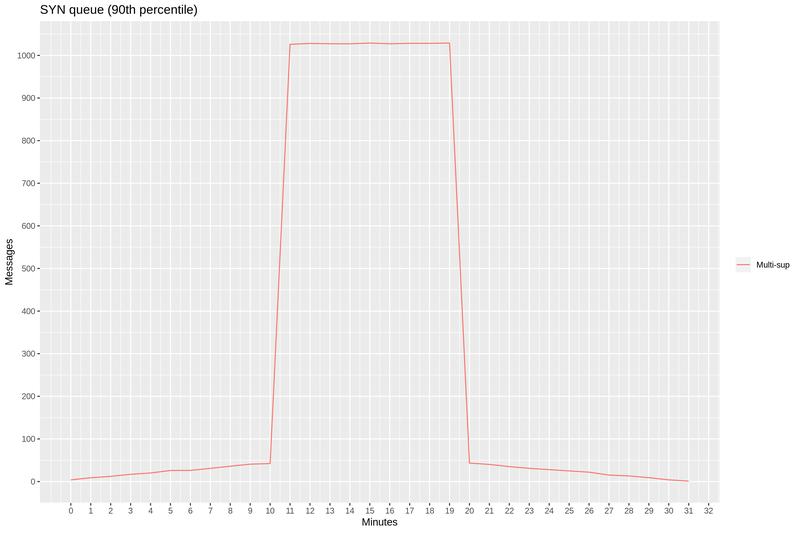 This results in the 90th percentile latency we saw earlier. [IMG]Modified Ranch is able to accept with higher degree of parallelism, but the accept() function gets invoked on a single shared listener socket. It turns out, the Linux kernel experiences contention when it comes to invoking accept() on the same listener socket. In 2010, a group of engineers from Google discussed the issues with lock contention and suboptimal load balancing in a presentation, where they also estimate the maximum connections per second rate to be around 50k (on 2010 hardware). Furthermore, they proposed a Linux kernel patch that introduced the SO_REUSEPORT socket option, that makes it possible to open many listener sockets on the same port, causing the sockets to be load-balanced when accepting new connections. To find out if the SO_REUSEPORT socket option would help, we created a proof of concept application in which we ran multiple Ranch listeners on the same port with SO_REUSEPORT set using the raw setops option. We set the number of listeners to be the same as the number of available CPUs. With this proof of concept, we again measured the number of connections in syn-recv state during our test. This number never gets close to 1k, meaning we’re no longer dropping SYN messages. 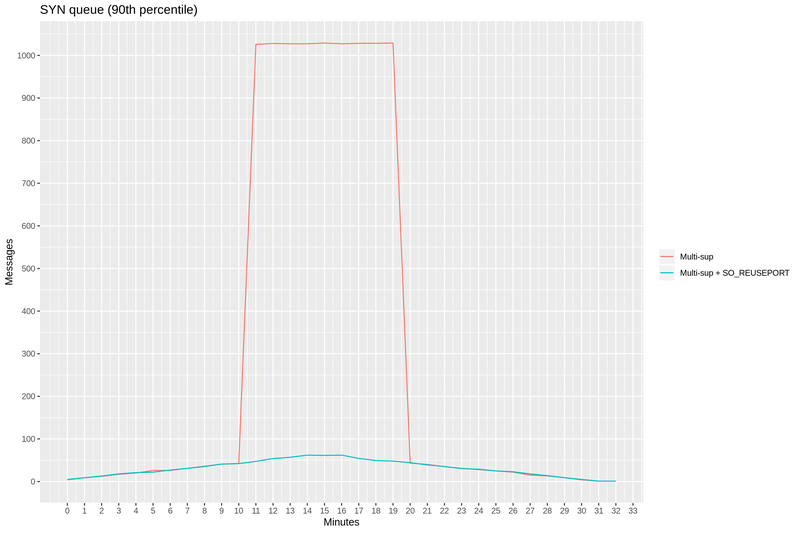 [IMG]90th percentile latency confirms our findings: it remains consistently low throughout the test. [IMG]When zooming in, 90th percentile latency measures between 1 and 2 milliseconds. 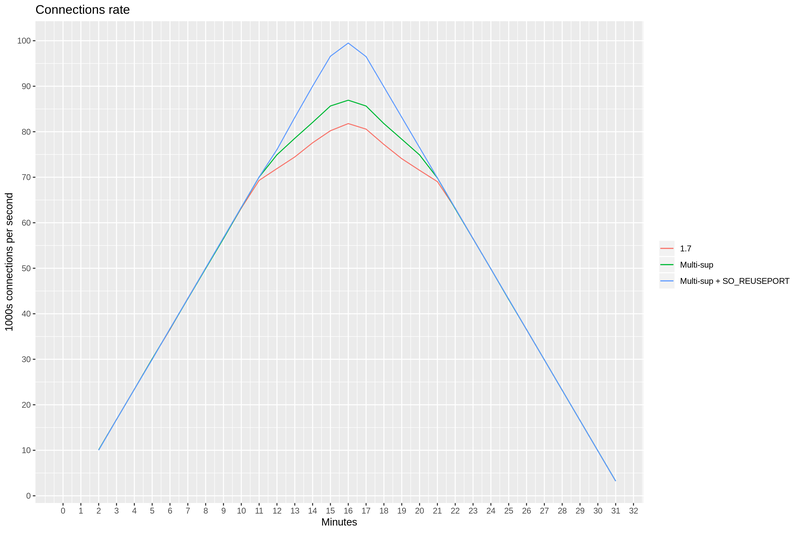 [IMG]We also observed much better CPU utilization, which resulted from less contention and fairer load balancing when accepting new connections. [IMG]Finally, the connections per second rate reaches 99k, with network latency and available CPU resources contributing to the next bottleneck. By analyzing the initial test results, proposing a theory, and confirming it by measuring against modified software, we were able to find two bottlenecks on the way to getting to 100k connections per second with Elixir and Ranch. The combination of multiple connection supervisors in Ranch and multiple listener sockets in the Linux kernel is necessary to achieve full utilization of the 36-core machine under the target workload. handling 1M websockets connections in Go. Contribute to eranyanay/1m-go-websockets development by creating an account on GitHub.